HUNTSVILLE — The long, remarkably storied history of hospitals in Huntsville is finally being told. Local politicians, health care administrators, their guests and staff were treated tonight to a preview of the brand-new museum exhibit “Healthy Huntsville: A Brief History of Health Care in Huntsville” at Muskoka Heritage Place, located at 88 Brunel Road, in Huntsville. Huntsville Mayor Scott Aitchison welcomed everyone Thursday evening. “Healthcare has always been important to the people of Huntsville,” he said in an advance copy of his opening remarks. 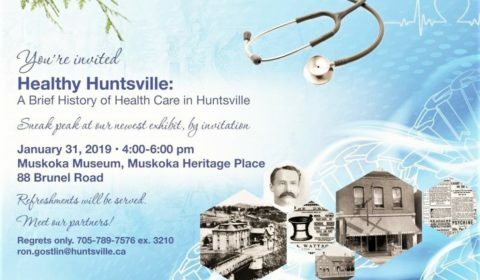 The Healthy Huntsville exhibit is collaborative between The Town of Huntsville/Muskoka Heritage Place, Muskoka Algonquin Health Care, Huntsville Hospital Auxiliary and the Huntsville Hospital Foundation. Representatives of each organization addressed those present, bringing messages of pride in the past and solidarity in the future. Information on how to support each partner organization today is included in the exhibit. The public was invited to the display opening Thursday, Feb. 1, promoting the long history of hospitals in Huntsville. Muskoka Heritage Place’s annual visitation is 15,000 people. Health care workers receive complimentary admission to Healthy Huntsville located in the Muskoka Museum at 88 Brunel Rd. with their affiliated identification. Visitors will enjoy a historic look at the history of health care in Huntsville, and it is a robust and interesting one. From snake oil to strange operations, from scary processes to seasoned and reasoned doctors and pre-payment plans, health care in Huntsville has long been a community endeavour. The Muskoka Museum is open weekdays from mid-October to mid-May and daily from mid-May to mid-October. In the winter season please contact Gostlin 705 789 7576 ex 3210; ron.gostlin@huntsville.ca to ensure we are available to welcome you. Admission to the museum for the Healthy Huntsville exhibit at the Museum, Pioneer Village and Train operation at Muskoka Heritage Place is $2.60 per adult and senior, and $1.65 per child aged 3 to 12 years. One child under 3 years of age is free with each adult paid admission.